This month, as a part of our continuing effort to give back to our patients and get them smiling more, we're giving away a Zoom Laser Whitening procedure. 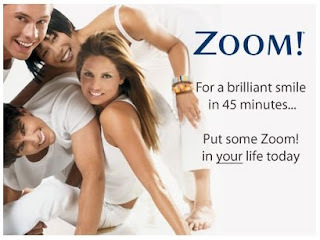 What is Zoom Laser Whitening? It's a chairside procedure done in our office that removes many of the stains and darkened colors that teeth take on with age. It's safe and effective -- and the whole thing is done in about an hour! You can even watch your favorite TV shows while it's being done. All recipients on our E-mail list are eligible!